If you're looking for the best break through motivational and inspirational speakers for your event look no further than Judy and Tim Sharp. Their perfectly titled book and keynote, A Double Shot of Happiness, has been captivating audiences everywhere. 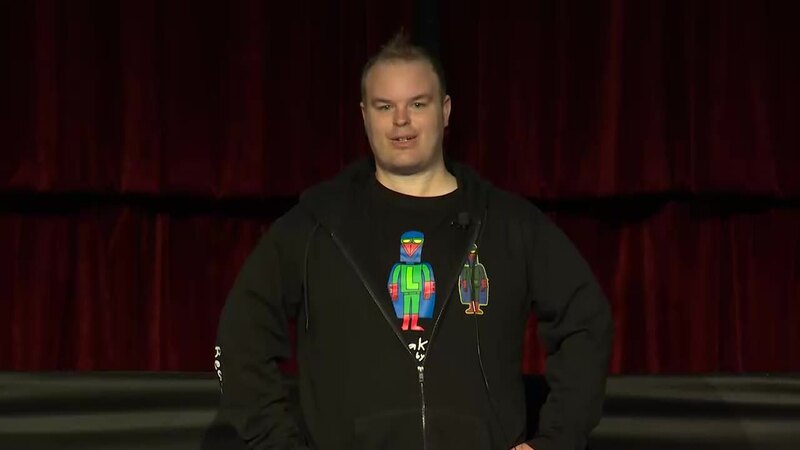 Tim Sharp is the first person with Autism to have his artwork turned into an animated series and is an international artist and speaker who is best known for his creation Laser Beak Man. Judy and Tim speak together and share their incredible story of adversity, persistence, resilience, triumph, success and inspiration. It is Tim and Judy's powerful past and their bright future that compells audiences everywhere to stand and applaud them. No matter who you are, or what you do, individuals, teams and organisations will walk away from this presentation with memorable messages and a unique experience. A Double Shot of Happiness is available in TEDx format or as a full 45 to 60 keynote. Thank you for sharing your story with us at our National Sales Conference. Today Tim’s artwork is being produced into an off-Broadway Play, he has been a finalist for Young Australian of the Year and he is an International artist and keynote speaker. All achievements his mum Judy would have not thought possible when Tim was a baby. When Tim was born in 1988 Judy realised quickly he wasn't like other babies his age. Yet it wasn't until the day after his 3rd birthday she told was told Tim had Autism and there was very little hope for his progress or development. But Judy never gave up and discovered she was able to open a door and communicate with Tim through drawing, a discovery that changed their lives forever. At 11 years of age Tim created Laser Beak Man. Laser Beak Man is a character who allows Tim to express his great sense of humour and intelligence as well as his original way of looking at life. 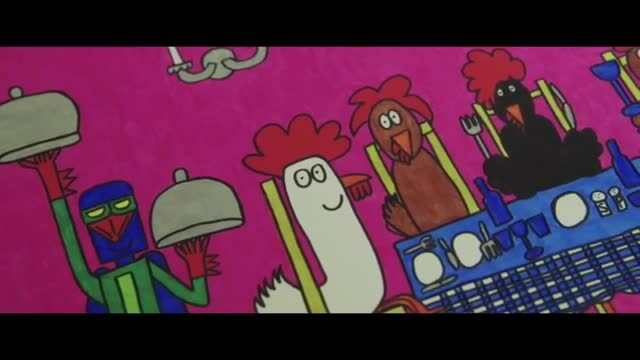 His artwork is known for being bright, vibrant and fun. At only 16 years old, Tim was the only Australian selected by a jury in the young adult drawing category for the VSA (Very Special Arts) Festival in Washington DC. Founded 30 years ago by Ambassador Jean Kennedy Smith - sister of President John F. Kennedy - VSA is the largest art festival in the world for people with disabilities. Acceptance to the festival was an extraordinary achievement and the story of Tim's trip to Washington DC was told on the ABC's "Australian Story." That was the beginning of his international art career. Laser Beak Man has his own 8 episode animated TV series screening on ABC3TV, Cartoon Network Asia, New Zealand and Australia. 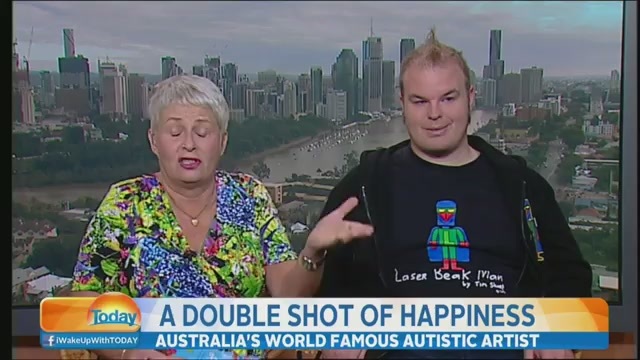 A world first for a young man with Autism to have his creation turned into a television series. In 2012 a short film about Tim was shown at the Metropolitan Museum of Modern Art in New York City. Exhibiting at the Sydney Opera House and the National Museum of Australia as well as Washington DC and New York, Tim's colourful art is very much in demand from international and Australian art collectors. Tim's exhibitions quickly sell out and his work is so popular that reproduction prints have been made to keep up with the demand. He was also a finalist for the Young Australian of the Year, received many awards and extensive Australian and international media coverage. 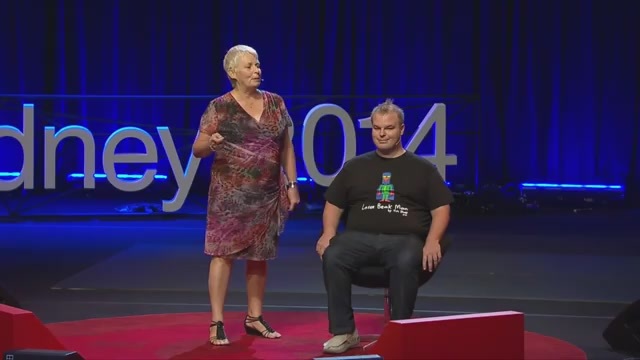 Life for Tim and Judy turned a corner again in 2014 when they delivered a powerful TEDx talk at the Sydney Opera House. A presentation that has since propelled them onto screens and stages around the world. They have truly triumphed over adversity and tell their story with authenticity, humour and joy. Their messages of hope, purpose and possibility inspires audiences to applaud them with standing ovations. A further testament to power of their story was the signing of their first book deal with Allen & Unwin. Perfectly titled A Double Shot of Happiness which was released in July 2015. Laser Beak Man is also being developed as part of the 2014-15 New Victory LabWorks Artist Residency Program (New Victory Theatre, NYC). Laser Beak Man the stage production begins it's Australian tour in September 2017 at the Brisbane Festival, with live music and production qualities never seen in Australia before. A truly wonderful achievement! 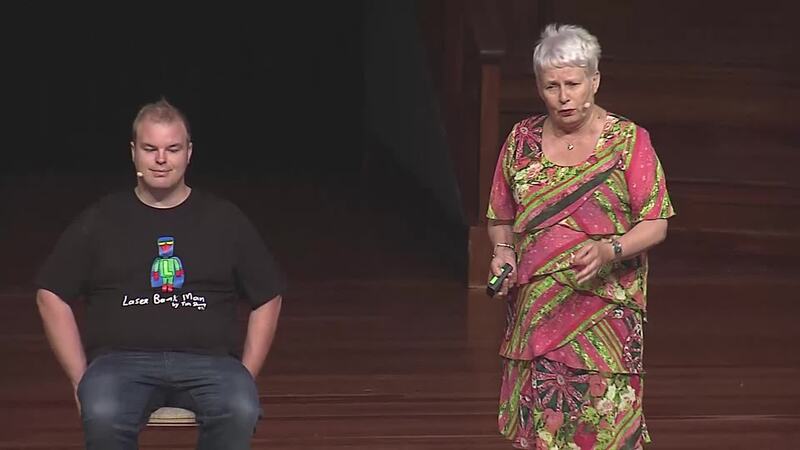 Judy and Tim share the story of their life, LaserBeakMan and their exciting plans for the future. A Double Shot of Happiness is available in TEDx format or as a full 45 to 60 keynote. Jessica Watson is the determined Queenslander who captured Australia's media when she announced her goal to become the youngest person to sail solo around the world.